In The Innovator’s Dilemma, author Clayton Christensen describes how new technologies emerge to take over markets. Initially, companies roll out products that serve the low-end of the market. They offer something cheaper and less functional than the product that currently dominates a market. After establishing a toehold in a niche, a company expands the capabilities of its product until its features start to “bump up” against those of the incumbent vendors. The incumbents, the original “innovators”, find themselves fighting at the lower margin end of their business. Tired of spending resources to protect low margin sales, they take themselves further up the functionality ladder, where they can charge a premium. 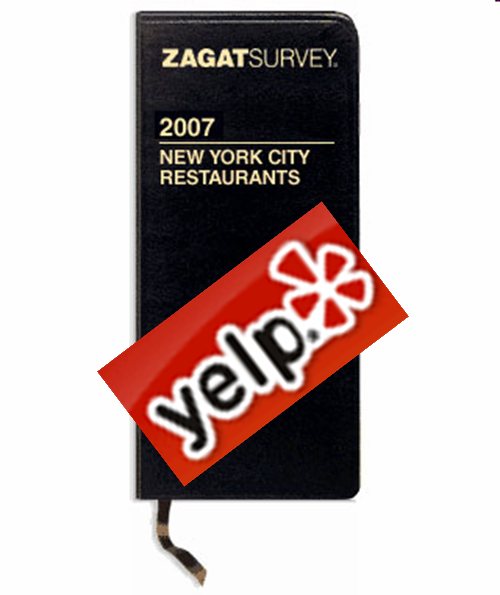 In the recent New York Times article, How Many Reviewers Should Be in the Kitchen, Randall Stross looks at how Yelp is eating away at Zagat’s business model. Zagat publishes the very successful Zagat Guides. Zagat’s reviewers give the low-down on restaurants in cities around the world: price, quality, service. I remember from my banking days that these were hit. And they cost money as well. Zagat has done well charging for their guides. Yelp is the Web 2.0 site where everyday people rate their experiences with all sorts of services, restaurants included. Typical of these user-generated content sites, the quality of Yelp reviews was uneven early on. But it was a quick way to see what someone thought of a place before you went. Well Yelp has gotten bigger and better. The site now has an army of reviewers. And power users with a flair for good reviews earn Yelp Elite status (my brother-in-law is one of them). Yelp started out pretty low-end, as most Web 2.0 companies do. But it appears that Yelp is now migrating upmarket in terms of quality. It’s starting to bump up against market leader Zagat. Fortunately, the sites that welcome customer reviews have evolved significantly. One of the best, Yelp, has replaced the cult of the anonymous amateur with a design that highlights the judgments of the exceptional few. These dedicated reviewers produce work that, in quantity and quality, increasingly approaches that of their professional forebears, and they are willing to divulge personal information about themselves. Because of Zagat’s 30-year history of subscriptions, the company’s mindset is one of actually making money via subscriptions, and that has served it well. The reluctance to give up something that’s generating real sales with real profits is understandable, but risks Zagat losing market share. I don’t have a crystal ball, but there’s enough history where companies that you might have said, “Oh, they’ll never overtake so-an-so” end up doing just that. It’s not an overnight thing, it takes years. But it’s a real phenomenon. We are naturally a progressive society which means the internet will progressively steal market share wherever it can compete with an offline product. Every business owner will need an internet marketing plan.